This article is about the ancient Jordanian city of Petra. For other uses, see Petra (disambiguation). The trading business gained the Nabataeans considerable revenue and Petra became the focus of their wealth. The earliest historical reference to Petra was an attack to the city ordered by Antigonus I in 312 BC recorded by various Greek historians. The Nabataeans were, unlike their enemies, accustomed to living in the barren deserts, and were able to repel attacks by utilizing the area's mountainous terrain. They were particularly skillful in harvesting rainwater, agriculture and stone carving. Petra flourished in the 1st century AD when its famous Khazneh structure – believed to be the mausoleum of Nabataean King Aretas IV – was constructed, and its population peaked at an estimated 20,000 inhabitants. Although the Nabataean Kingdom became a client state for the Roman Empire in the first century BC, it was only in 106 AD that they lost their independence. Petra fell to the Romans, who annexed and renamed Nabataea to Arabia Petraea. Petra's importance declined as sea trade routes emerged, and after a 363 earthquake destroyed many structures. The Byzantine Era witnessed the construction of several Christian churches, but the city continued to decline, and by the early Islamic era became an abandoned place where only a handful of nomads lived. It remained unknown to the world until it was rediscovered in 1812 by Johann Ludwig Burckhardt. The city is accessed through a 1.2-kilometre-long (0.75 mi) gorge called the Siq, which leads directly to the Khazneh. Famous for its rock-cut architecture and water conduit system, Petra is also called the Rose City due to the color of the stone out of which it is carved. It has been a UNESCO World Heritage Site since 1985. UNESCO has described it as "one of the most precious cultural properties of man's cultural heritage". In 2007, Al-Khazneh was voted in as one of the New7Wonders of the World. Petra is a symbol of Jordan, as well as Jordan's most-visited tourist attraction. Tourist numbers peaked at 1 million in 2010; the following period witnessed a slump due to instability around Jordan. However, tourist numbers have picked up recently, and around 800,000 tourists visited the site in 2018. Pliny the Elder and other writers identify Petra as the capital of the Tadeanos and the center of their caravan trade. Enclosed by towering rocks and watered by a perennial stream, Petra not only possessed the advantages of a fortress, but controlled the main commercial routes which passed through it to Gaza in the west, to Bosra and Damascus in the north, to Aqaba and Leuce Come on the Red Sea, and across the desert to the Persian Gulf. A little further from the Treasury, at the foot of the mountain called en-Nejr, is a massive theatre, positioned so as to bring the greatest number of tombs within view. At the point where the valley opens out into the plain, the site of the city is revealed with striking effect. The theatre has been cut into the hillside and into several of the tombs during its construction. Rectangular gaps in the seating are still visible. Almost enclosing it on three sides are rose-colored mountain walls, divided into groups by deep fissures and lined with knobs cut from the rock in the form of towers. In Petra, there is a semi-arid climate. Most rain falls in the winter. The Köppen-Geiger climate classification is BSk. The average annual temperature in Petra is 15.5 °C (59.9 °F). About 193 mm (7.60 in) of precipitation falls annually. By 2010 BC, some of the earliest recorded farmers had settled in Beidha, a pre-pottery settlement just north of Petra. Petra is listed in Egyptian campaign accounts and the Amarna letters as Pel, Sela or Seir. Though the city was founded relatively late, a sanctuary has existed there since very ancient times. Historian Josephus (ca. 37–100) describes the region as inhabited by the Madianite nation as early as 1340 BC, and that the nation was governed by five kings, whom he names: "Rekem; the city which bears his name ranks highest in the land of the Arabs and to this day is called by the whole Arabian nation, after the name of its royal founder, Rekeme: called Petra by the Greeks." The famed architecture of Petra, and other Nabataean sites, was built during indigenous rule in early antiquity. The name "Rekem" was inscribed in the rock wall of the Wadi Musa opposite the entrance to the Siq. However, Jordan built a bridge over the wadi and this inscription was buried beneath tons of concrete. In AD 106, when Cornelius Palma was governor of Syria, the part of Arabia under the rule of Petra was absorbed into the Roman Empire as part of Arabia Petraea, and Petra became its capital. The native dynasty came to an end but the city continued to flourish under Roman rule. It was around this time that the Petra Roman Road was built. A century later, in the time of Alexander Severus, when the city was at the height of its splendor, the issue of coinage comes to an end. There is no more building of sumptuous tombs, owing apparently to some sudden catastrophe, such as an invasion by the neo-Persian power under the Sassanid Empire. Meanwhile, as Palmyra (fl. 130–270) grew in importance and attracted the Arabian trade away from Petra, the latter declined. It appears, however, to have lingered on as a religious centre. Another Roman road was constructed at the site. Epiphanius of Salamis (c.315–403) writes that in his time a feast was held there on December 25 in honor of the virgin Khaabou (Chaabou) and her offspring Dushara. Dushara and al-Uzza were two of the main deities of the city, which otherwise included many idols from other Nabatean deities such as Allat and Manat. Petra declined rapidly under Roman rule, in large part from the revision of sea-based trade routes. In 363 an earthquake destroyed many buildings, and crippled the vital water management system. The old city of Petra was the capital of the Byzantine province of Palaestina III and many churches were excavated in and around Petra from the Byzantine era. In one of them 140 papyri were discovered which contained mainly contracts, dated from 537 to 593, establishing that the city was still flourishing in the sixth century. In the 12th century, the Crusaders built fortresses but left this place after a while. As a result, Petra was forgotten for the Western world until the 19th century. The ruins of Petra were an object of curiosity during the Middle Ages and were visited by Sultan Baibars of Egypt towards the end of the 13th century. The first European to describe them was Swiss traveller Johann Ludwig Burckhardt during his travels in 1812. At that time, the Greek Church of Jerusalem operated a diocese in Al Karak named Battra (باطره in Arabic, and Πέτρας in Greek) and it was the opinion among the clergy of Jerusalem that Kerak was the ancient city of Petra. The Scottish painter David Roberts visited Petra in 1839 and returned to England with sketches and stories of the encounter with local tribes. The archaeologist Philip Hammond from the University of Utah, USA, has visited Petra for nearly 40 years. He explains that the local folklore says it was created by the wand of Moses, when he struck the rock to bring forth water for the Israelites. Hammond believes the carved channels deep within the walls and ground were made from ceramic pipes that once fed water for the city, from rock-cut systems on the canyon rim. 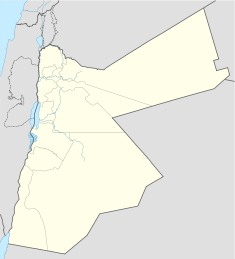 The Bidoul/Bidul or Petra Bedouin were forcibly resettled from their cave dwellings in Petra to Umm Sayhoun/ Um Seihun by the Jordanian government in 1985, prior to the UNESCO designation process. Here, they were provided with block-built housing with some infrastructure including in particular a sewage and drainage system. Among the six communities in the Petra Region, Umm Sayhoun is one of the smaller communities. The village of Wadi Musa is the largest in the area, inhabited largely by the Layathnah Bedouin, and is now the closest settlement to the visitor centre, the main entrance via the Siq and the archaeological site generally. Umm Sayhoun gives access to the 'back route' into the site, the Wadi Turkmaniyeh pedestrian route. In 2016, archaeologists discovered a large, previously unknown monumental structure buried beneath the sands of Petra using satellite imagery. People for the Ethical Treatment of Animals (PETA) released a video in 2018 highlighting abuse against working animals in Petra. PETA claimed that animals are forced to carry tourists or pull carriages every day. The video showed handlers beating and whipping working animals, with beatings intensifying when animals faltered. PETA also revealed some wounded animals, including camels with fly-infested, open wounds. The Jordanian authority running the site responded by opening up a veterinarian clinic, and by spreading awareness among animal handlers. Christianity found its way to Petra in the 4th century AD, nearly 500 years after the establishment of Petra as a trade center. Athanasius mentions a bishop of Petra (Anhioch. 10) named Asterius. At least one of the tombs (the "tomb with the urn"?) was used as a church. An inscription in red paint records its consecration "in the time of the most holy bishop Jason" (447). After the Islamic conquest of 629–632 Christianity in Petra, as of most of Arabia, gave way to Islam. During the First Crusade Petra was occupied by Baldwin I of the Kingdom of Jerusalem and formed the second fief of the barony of Al Karak (in the lordship of Oultrejordain) with the title Château de la Valée de Moyse or Sela. It remained in the hands of the Franks until 1189. It is still a titular see of the Catholic Church. According to Arab tradition, Petra is the spot where Musa (Moses) struck a rock with his staff and water came forth, and where Moses' brother, Harun (Aaron), is buried, at Mount Hor, known today as Jabal Haroun or Mount Aaron. The Wadi Musa or "Wadi of Moses" is the Arab name for the narrow valley at the head of which Petra is sited. A mountaintop shrine of Moses' sister Miriam was still shown to pilgrims at the time of Jerome in the 4th century, but its location has not been identified since. Herman Melville compares Wall Street on a Sunday morning to the abandoned city of Petra in his 1853 short story "Bartleby, the Scrivener." Petra appeared in the novels Left Behind Series, Appointment with Death, The Eagle in the Sand, The Red Sea Sharks, the nineteenth book in The Adventures of Tintin series and in Kingsbury's The Moon Goddess and the Son. It played a prominent role in the Marcus Didius Falco mystery novel Last Act in Palmyra. In Blue Balliett's novel, Chasing Vermeer, the character Petra Andalee is named after the site. Playwright John Yarbrough's tragicomedy, Petra, debuted at the Manhattan Repertory Theatre in 2014 and was followed by award-winning performances at the Hudson Guild in New York in 2015. It was selected for the Best American Short Plays 2014-2015 anthology. The site appeared in films such as: Indiana Jones and the Last Crusade, Arabian Nights, Passion in the Desert, Mortal Kombat: Annihilation, Sinbad and the Eye of the Tiger, The Mummy Returns, Transformers: Revenge of the Fallen, Samsara and Kajraare. Petra appeared in episode 3 of the 2010 series An Idiot Abroad. Petra appeared in episode 20 of Misaeng. Petra appeared in an episode of Time Scanners, made for National Geographic, where six ancient structures were laser scanned, with the results built into 3D models. Examining the model of Petra revealed insights into how the structure was built. Petra was the focus of an American PBS Nova special, "Petra: Lost City of Stone", which premiered in the US and Europe in February 2015. The power metal band Helloween referred to Petra on their 2013 track "Nabataea" off their album, Straight Out of Hell. In 1977, the Lebanese Rahbani brothers wrote the musical "Petra" as a response to the Lebanese Civil War. The Sisters of Mercy filmed their music video for "Dominion/Mother Russia" in and around Al Khazneh ("The Treasury") in February 1988. In 1994 Petra appeared in the video to the Urban Species video Spiritual Love. An Austrian symphonic metal band Serenity referred to Petra on their fourth studio album War of Ages (Serenity album) in the track "Shining Oasis"
Petra was recreated for the video games Spy Hunter (2001), Outrun 2, King's Quest V, Lego Indiana Jones, Sonic Unleashed, Knights of the Temple: Infernal Crusade, Civilization V, Civilization VI, Europa Universalis IV, Metal Gear Solid 5: The Phantom Pain, Overwatch, Age of Decadence and Total War Rome 2. ^ "Management of Petra". Petra National Trust. Retrieved 14 April 2015. One or more of the preceding sentences incorporates text from a publication now in the public domain: Cooke, George Albert (1911). "Petra" . In Chisholm, Hugh (ed.). Encyclopædia Britannica. 21 (11th ed.). Cambridge University Press. pp. 309–310. ^ Seeger, Josh; Gus W. van Beek (1996). Retrieving the Past: Essays on Archaeological Research and Methodolog. Eisenbrauns. p. 56. ISBN 978-1575060125. ^ "Petra Lost and Found". National Geographic. 2 January 2016. Retrieved 8 April 2018. ^ Glueck, Grace (17 October 2003). "ART REVIEW; Rose-Red City Carved From the Rock" – via NYTimes.com. ^ "UNESCO advisory body evaluation" (PDF). Retrieved 2011-12-05. ^ "Petra: Water Works". Nabataea.net. Retrieved 2011-12-05. ^ Lisa Pinsker (2001-09-11). "Geotimes – June 2004 – Petra: An Eroding Ancient City". Agiweb.org. Retrieved 2011-12-05. ^ "Robert Fulford's column about Petra, Jordan". Robertfulford.com. 1997-06-18. Retrieved 2014-02-06. ^ "A Short History". Petra National Foundation. Retrieved 13 February 2014. ^ a b Jane, Taylor (2001). Petra and the Lost Kingdom of the Nabataeans. London, United Kingdom: I.B.Tauris. pp. 14, 17, 30, 31. ISBN 9781860645082. Retrieved 8 July 2016. ^ Maalouf, Tony (2003). Arabs in the Shadow of Israel: The Unfolding of God's Prophetic Plan for Ishmael's Line. Kregel Academic. ISBN 9780825493638. Retrieved 8 July 2016. ^ Diodorus Siculus' account of Antigonus' expedition to Arabia, xix, section 95 (note 79). ^ "History of Petra". Terhaal Adventures. Retrieved 2015-09-10. ^ Glueck, Grace (2003-10-17). "ART REVIEW; Rose-Red City Carved From the Rock". The New York Times. Retrieved 2010-05-22. ^ Frösén, Jaakko (2012). "Petra papyri". The Encyclopedia of Ancient History. Blackwell Publishing Ltd. doi:10.1002/9781444338386.wbeah06244. ISBN 9781444338386. ^ "Nabataea: The Crusades". nabataea.net. Retrieved 2018-12-25. ^ Lawler, Andrew. "Reconstructing Petra". Smithsonian. Retrieved 2018-12-25. ^ a b John Lewis Burckhardt (1822). Travels in Syria and the Holy Land. J. Murray. ^ National Geographic documentary : Forbidden Archaeology of Petra and Nazca, 2018. ^ "Map of the area from the go2petra website". ^ "Archeological Park - Visit Petra". visitpetra.jo. Retrieved 2018-12-25. ^ Parcak, Sarah; Tuttle, Christopher A. (May 2016). "Hiding in Plain Sight: The Discovery of a New Monumental Structure at Petra, Jordan, Using WorldView-1 and WorldView-2 Satellite Imagery". Bulletin of the American Schools of Oriental Research (375): 35–51. doi:10.5615/bullamerschoorie.375.0035. ISSN 0003-097X. JSTOR 10.5615/bullamerschoorie.375.0035. ^ "Archaeologists discover massive Petra monument that could be 2,150 years old". The Guardian. 10 June 2016. Retrieved 10 June 2016. ^ "Massive New Monument Found in Petra". National Geographic. 8 June 2016. Retrieved 10 June 2016. 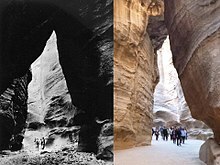 ^ "Heritage Conservation Grips Jordan's Petra Amid Booming Tourism". Xinhua News Agency. November 3, 2007. Archived from the original on September 18, 2009. ^ "Petra National Trust-About". Petranationaltrust.org. Archived from the original on 2011-12-28. Retrieved 2011-12-05. ^ Comer and Willems. "Tourism and Archaeological Heritage Management at Petra: Driver to Development or Destruction?" (PDF). Retrieved 2015-09-10. ^ Usher, Sebastian (January 16, 2018). "Jordan urged to end animal mistreatment at Petra site". BBC News. Retrieved February 28, 2018. ^ "Stakeholders take steps to address animal abuse in Petra". Saeb Rawashdeh. The Jordan Times. 5 April 2018. Retrieved 19 April 2018. ^ Paradise T.R. & Angel C.C. 2015, Nabatean Architecture and the Sun, ArcUser (Winter). Herbermann, Charles, ed. (1913). "Petra" . Catholic Encyclopedia. New York: Robert Appleton Company. ^ "Petra". Sacred Sites. Retrieved 2011-12-05. ^ Balliett, Blue (2004). Chasing Vermeer: Afterwords by Leslie Budnick: Author Q&A. Scholastic. ISBN 978-0-439-37294-7. ^ Geldermalsen, Marguerite (2010). Married to a Bedouin. Virago UK. ISBN 978-1844082209. ^ Ward, Joan (2014). Living With Arabs: Nine Years with the Petra Bedouin. UM Peter Publishing. ISBN 978-1502564917. ^ "John Yarbrough's Petra on Youtube". ^ "Manhattan Repertory Theatre fall one act competition 2014 including John Yarbrough's Petra". Retrieved 2015-06-04. ^ "Broadwayworld, Off-Off-Broadway, article: 'Playwright John Yarbrough Wins Strawberry One Act Festival'". Retrieved 2015-06-04. ^ "Broadwayworld, Off-Off-Broadway, article: 'The Best American Short Plays 2014-15 Hits the Shelves'". ^ "Colonnade Street, Petra". Madain Project. Retrieved 7 April 2019. ^ "Scenes for TV drama series 'Misaeng' shot around Kingdom.The Jordan Times". The Jordan Times. 2014-09-23. ^ "Misaeng Episode 20 Final". dramabeans.com. 2014-12-24. ^ "Time Scanners: How was Petra built?". Science Focus - BBC Focus Magazine. ^ "Petra-Lost City in building-wonders at pbs.org". ^ Stone, Christopher. Popular Culture and Nationalism in Lebanon. ^ "The Sisters of Mercy". IMDb. ^ "Spiritual Love - NMETV Latest Music Videos and Clips - - NME.COM". web.archive.org. 9 November 2012. ^ "The Rose-Red City of Petra". Grisel.net. 2001-04-26. Retrieved 2012-04-17. Bedal, Leigh-Ann (2004). The Petra Pool-Complex: A Hellenistic Paradeisos in the Nabataean Capital. Piscataway, NJ: Gorgias Press. ISBN 978-1-59333-120-7. Brown University. "The Petra Great Temple; History" Accessed April 19, 2013. Harty, Rosemary. "The Bedouin Tribes of Petra Photographs: 1986–2003". Retrieved 2008-07-17. Mouton, Michael and Schmid, Stephen G. (2013) "Men on the Rocks: The Formation of Nabataean Petra"
Paradise, T. R. (2011). "Architecture and Deterioration in Petra: Issues, trends and warnings" in Archaeological Heritage at Petra: Drive to Development or Destruction?" (Doug Comer, editor), ICOMOS-ICAHM Publications through Springer-Verlag NYC: 87–119. Paradise, T. R. (2005). "Weathering of sandstone architecture in Petra, Jordan: influences and rates" in GSA Special Paper 390: Stone Decay in the Architectural Environment: 39–49. Reid, Sara Karz (2006). The Small Temple. Piscataway, NJ: Gorgias Press. ISBN 978-1-59333-339-3. Reid explores the nature of the small temple at Petra and concludes it is from the Roman era. UNESCO World Heritage Centre. "Petra" Accessed April 19, 2013.